Caran d’Ache Sunset is such a pretty color. Before you fall in love with it, though, you should know something. In fact, the entire line is being refreshed. Here’s a post about it from back in February on Ink Nouveau. The new ink names amuse me. The new price does not. At 40 bucks a bottle, it better be some impressssive ink, right? It’s a good ink. I liked it a lot. After writing with it for a week, I no longer thought it was true red – too many pink-ish tones for that, but it is a beautiful color. Have you ever had a favorite ink end up discontinued? I have not – yet. 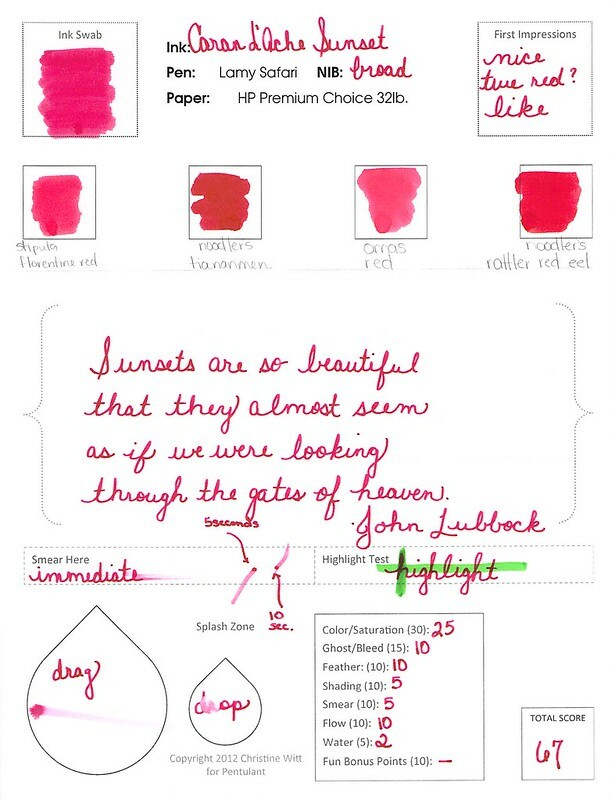 This entry was posted in INKS and tagged caran d'ache, red by Christine (Pentulant). Bookmark the permalink.